Common (greater than 2% of patients treated with Terbinafine tablets) reported adverse events include headache, diarrhea, rash, dyspepsia, liver enzyme abnormalities, pruritus, taste disturbance, nausea, abdominal pain, and flatulence. ( 6.1). To report SUSPECTED ADVERSE REACTIONS, contact Breckenridge Pharmaceutical, Inc. at 1-800-367-3395, or go to www.bpirx.com, or FDA at 1-800-FDA-1088 or www.fda.gov/medwatch. Before administering Terbinafine tablets, evaluate patients for evidence of chronic or active liver disease [see Contraindications (4) and Warnings and Precautions (5.1)] . Terbinafine tablets are contraindicated for patients with chronic or active liver disease. Before prescribing Terbinafine tablets, perform liver function tests because hepatotoxicity may occur in patients with and without preexisting liver disease. Cases of liver failure, some leading to liver transplant or death, have occurred with the use of Terbinafine tablets in individuals with and without preexisting liver disease. In the majority of liver cases reported in association with use of Terbinafine tablets, the patients had serious underlying systemic conditions. The severity of hepatic events and/or their outcome may be worse in patients with active or chronic liver disease. Periodic monitoring of liver function tests is recommended. Discontinue Terbinafine tablets if biochemical or clinical evidence of liver injury develops.In the majority of liver cases reported in association with use of Terbinafine tablets, the patients had serious underlying systemic conditions. The severity of hepatic events and/or their outcome may be worse in patients with active or chronic liver disease. Periodic monitoring of liver function tests is recommended. Discontinue Terbinafine tablets if biochemical or clinical evidence of liver injury develops. Warn patients prescribed Terbinafine tablets and/or their caregivers to report immediately to their healthcare providers any symptoms or signs of persistent nausea, anorexia, fatigue, vomiting, right upper abdominal pain or jaundice, dark urine, or pale stools. Advise patients with these symptoms to discontinue taking oral terbinafine, and immediately evaluate the patient's liver function.Warn patients prescribed Terbinafine tablets and/or their caregivers to report immediately to their healthcare providers any symptoms or signs of persistent nausea, anorexia, fatigue, vomiting, right upper abdominal pain or jaundice, dark urine, or pale stools. Advise patients with these symptoms to discontinue taking oral terbinafine, and immediately evaluate the patient's liver function. Transient decreases in absolute lymphocyte counts (ALCs) have been observed in controlled clinical trials. In placebo-controlled trials, 8/465 subjects receiving Terbinafine tablets (1.7%) and 3/137 subjects receiving placebo (2.2%) had decreases in ALC to below 1000/mm 3 on 2 or more occasions. In patients with known or suspected immunodeficiency, physicians should consider monitoring complete blood counts if treatment continues for more than 6 weeks. Cases of severe neutropenia have been reported. These were reversible upon discontinuation of Terbinafine tablets, with or without supportive therapy. If clinical signs and symptoms suggestive of secondary infection occur, a complete blood count should be obtained. If the neutrophil count is less than or equal to 1000 cells/mm 3, Terbinafine tablets should be discontinued and supportive management started. Cases of thrombotic microangiopathy (TMA), including thrombotic thrombocytopenic purpura and hemolytic uremic syndrome, some fatal, have been reported with terbinafine. Discontinue terbinafine if clinical symptoms and laboratory findings consistent with TMA occur. The findings of unexplained thrombocytopenia and anemia should prompt further evaluation and consideration of diagnosis of TMA. Because clinical trials are conducted under widely varying conditions, adverse reaction rates in the clinical trials of a drug cannot be directly compared to rates in the clinical trials of another drug and may not reflect the rates observed in practice. The most frequently reported adverse events observed in the 3 US/Canadian placebo-controlled trials are listed in the table below. The adverse events reported encompass gastrointestinal symptoms (including diarrhea, dyspepsia, and abdominal pain), liver test abnormalities, rashes, urticaria, pruritus, and taste disturbances. Changes in the ocular lens and retina have been reported following the use of Terbinafine tablets in controlled trials. The clinical significance of these changes is unknown. In general, the adverse events were mild, transient, and did not lead to discontinuation from study participation. • Liver enzyme abnormalities greater than or equal to 2× the upper limit of normal range. Psychiatric disorders: Anxiety and depressive symptoms independent of taste disturbance have been reported with use of Terbinafine tablets. In some cases, depressive symptoms have been reported to subside with discontinuance of therapy and to recur with reinstitution of therapy [see Warnings and Precautions (5.4)] . Nervous system disorders: Cases of taste disturbance, including taste loss, have been reported with the use of Terbinafine tablets. It can be severe enough to result in decreased food intake, weight loss, anxiety, and depressive symptoms. Cases of smell disturbance, including smell loss, have been reported with the use of Terbinafine tablets [see Warnings and Precautions (5.2, 5.3)] . Cases of paresthesia and hypoesthesia have been reported with the use of Terbinafine tablets. Hepatobiliary disorders: Cases of liver failure some leading to liver transplant or death [see Warnings and Precautions (5.1)] , idiosyncratic and symptomatic hepatic injury. Cases of hepatitis, cholestasis, and increased hepatic enzymes [see Warnings and Precautions (5.1)] have been seen with the use of Terbinafine tablets. In vivo studies have shown that terbinafine is an inhibitor of the CYP450 2D6 isozyme. Drugs predominantly metabolized by the CYP450 2D6 isozyme include the following drug classes: tricyclic antidepressants, selective serotonin reuptake inhibitors, beta-blockers, antiarrhythmics class 1C (e.g., flecainide and propafenone) and monoamine oxidase inhibitors Type B. Coadministration of Terbinafine tablets should be done with careful monitoring and may require a reduction in dose of the 2D6-metabolized drug. In a study to assess the effects of terbinafine on desipramine in healthy volunteers characterized as normal metabolizers, the administration of terbinafine resulted in a 2-fold increase in C max and a 5-fold increase in area under the curve (AUC). In this study, these effects were shown to persist at the last observation at 4 weeks after discontinuation of Terbinafine tablets. In studies in healthy subjects characterized as extensive metabolizers of dextromethorphan (antitussive drug and CYP2D6 probe substrate), terbinafine increases the dextromethorphan/ dextrorphan metabolite ratio in urine by 16- to 97-fold on average. Thus, terbinafine may convert extensive CYP2D6 metabolizers to poor metabolizer status. In vitro studies with human liver microsomes showed that terbinafine does not inhibit the metabolism of tolbutamide, ethinylestradiol, ethoxycoumarin, cyclosporine, cisapride and fluvastatin. In vivo drug-drug interaction studies conducted in healthy volunteer subjects showed that terbinafine does not affect the clearance of antipyrine or digoxin. Terbinafine decreases the clearance of caffeine by 19%. Terbinafine increases the clearance of cyclosporine by 15%. Coadministration of a single dose of fluconazole (100 mg) with a single dose of terbinafine resulted in a 52% and 69% increase in terbinafine C max and AUC, respectively. Fluconazole is an inhibitor of CYP2C9 and CYP3A enzymes. Based on this finding, it is likely that other inhibitors of both CYP2C9 and CYP3A4 (e.g., ketoconazole, amiodarone) may also lead to a substantial increase in the systemic exposure (C max and AUC) of terbinafine when concomitantly administered. Oral reproduction studies have been performed in rabbits and rats at doses up to 300 mg/kg/day [12× to 23× the maximum recommended human dose (MRHD), in rabbits and rats, respectively, based on body surface area (BSA) comparisons] and have revealed no evidence of impaired fertility or harm to the fetus due to terbinafine. Terbinafine tablets are contraindicated for patients with chronic or active liver disease [see Contraindications (4) and Warnings and Precautions (5.1)] . Cases of liver failure, some leading to liver transplant or death, have occurred with the use of Terbinafine tablets in individuals with and without preexisting liver disease. The severity of hepatic events and/or their outcome may be worse in patients with active or chronic liver disease. 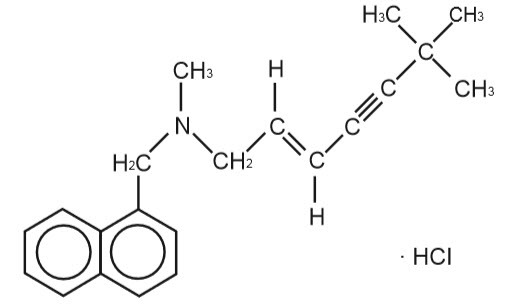 Terbinafine is an allylamine antifungal [see Clinical Pharmacology (12.4)] . Following oral administration, terbinafine is well absorbed (greater than 70%) and the bioavailability of Terbinafine tablets as a result of first-pass metabolism is approximately 40%. Peak plasma concentrations of 1 mcg/mL appear within 2 hours after a single 250 mg dose; the AUC is approximately 4.56 mcgh/mL. An increase in the AUC of terbinafine of less than 20% is observed when Terbinafine tablets are administered with food. In plasma, terbinafine is greater than 99% bound to plasma proteins and there are no specific binding sites. At steady-state, in comparison to a single dose, the peak concentration of terbinafine is 25% higher and plasma AUC increases by a factor of 2.5; the increase in plasma AUC is consistent with an effective half-life of ~36 hours. Terbinafine is distributed to the sebum and skin. A terminal half-life of 200-400 hours may represent the slow elimination of terbinafine from tissues such as skin and adipose. Prior to excretion, terbinafine is extensively metabolized by at least 7 CYP isoenzymes with major contributions from CYP2C9, CYP1A2, CYP3A4, CYP2C8, and CYP2C19. No metabolites have been identified that have antifungal activity similar to terbinafine. Approximately 70% of the administered dose is eliminated in the urine. In a 28-month oral carcinogenicity study in rats, an increase in the incidence of liver tumors was observed in males at the highest dose tested, 69 mg/kg/day (2× the MRHD based on AUC comparisons of the parent terbinafine); however, even though dose-limiting toxicity was not achieved at the highest tested dose, higher doses were not tested. Oral reproduction studies in rats at doses up to 300 mg/kg/day (approximately 12× the MRHD based on BSA comparisons) did not reveal any specific effects on fertility or other reproductive parameters. Intravaginal application of terbinafine hydrochloride at 150 mg/day in pregnant rabbits did not increase the incidence of abortions or premature deliveries nor affect fetal parameters. A wide range of in vivo studies in mice, rats, dogs, and monkeys, and in vitro studies using rat, monkey, and human hepatocytes suggest that peroxisome proliferation in the liver is a rat-specific finding. However, other effects, including increased liver weights and APTT, occurred in dogs and monkeys at doses giving C ss trough levels of the parent terbinafine 2-3× those seen in humans at the MRHD. Higher doses were not tested. The efficacy of Terbinafine tablets in the treatment of onychomycosis is illustrated by the response of subjects with toenail and/or fingernail infections who participated in 3 US/Canadian placebo-controlled clinical trials. Terbinafine Tablets, USP are supplied as white, oblong, unscored tablets debossed "B" and "526" on one side and plain on the other side. Store Terbinafine Tablets, USP at 20° - 25°C (68° - 77°F) [See USP Controlled Room Temperature]. Liver problems that can lead to the need for a liver transplant or death. This can happen in people who have liver problems and in people who have never had liver problems. Tell your doctor right away if you get any of these symptoms of liver problems: Your doctor should do a blood test to check you for liver problems before you start treatment with Terbinafine tablets. Your doctor may also check you for liver problems during treatment, and tell you to stop taking Terbinafine tablets if you develop liver problems. Terbinafine tablets are a prescription medicine used to treat fungal infections of the fingernails and toenails (onychomycosis). Your doctor should do tests to check you for fungal infection of your nails before you start Terbinafine tablets. It is not known if Terbinafine tablets are safe and effective in children for the treatment of onychomycosis. are breastfeeding or plan to breastfeed. Terbinafine passes into your breast milk and may harm your baby. You should not breastfeed while taking Terbinafine tablets. Talk to your doctor about the best way to feed your baby if you take Terbinafine tablets. Take Terbinafine tablets exactly as your doctor tells you to take it. Terbinafine tablets come as a tablet that you take by mouth. See " What is the most important information I should know about Terbinafine tablets?" change in your mood or depressive symptoms. See the list of depressive symptoms below. Store Terbinafine Tablets at 20° - 25°C (68° - 77°F) [See USP Controlled Room Temperature]. Medicines are sometimes prescribed for purposes other than those listed in Medication Guide. Do not use Terbinafine tablets for a condition for which it was not prescribed. Do not give Terbinafine tablets to other people, even if they have the same symptoms that you have. It may harm them. You can ask your pharmacist or doctor for information about Terbinafine tablets that is written for health professionals. For more information, call 1-800-367-3395 or go to www.bpirx.com.